Presenting the Little Katie Dress and Leggings sewing pattern by uber talented indie pattern designer Jules Fallon of Stratford upon Avon-based Sew Me Something. 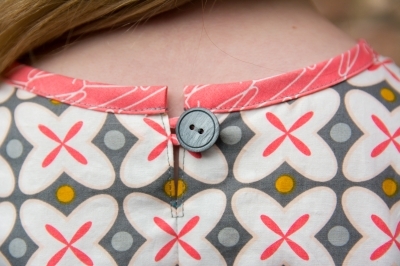 Want to make a smaller version of Sew Me Something’s ever-popular Kate Dress just for your little one? 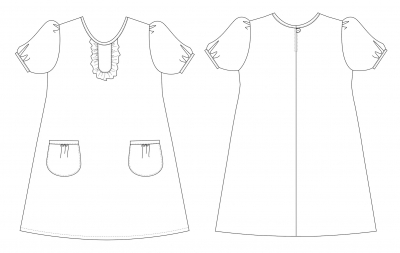 This pattern allows for a short and long-sleeved version of the adorable dress, but with the added detail of a placket and frill. And on the back there’s the little bonus of rouleau loop and button to make it easier to slip on and off. 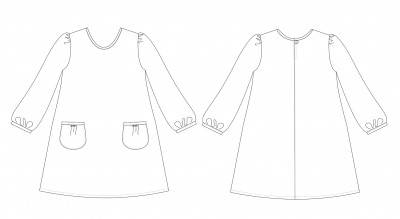 Version 1 offers a plain scoop neckline and set in sleeves with a slight gather at the sleeve head along with bound patch pockets. Version 2 offers long sleeves for cooler months. We see this cutie pie of a dress in so many of our cotton fabrics, or make it extra special with one of our stunning Lady McElroy linens! 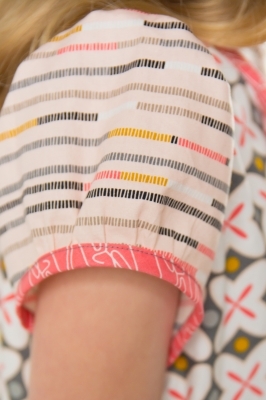 Create your Katie Dress in sizes for ages 3 to 9..
Sew Me Something recommends the following fabrics for your Katie Dress: printed craft cotton, linen, poplin, lightweight wool, lightweight denim or needlecord. 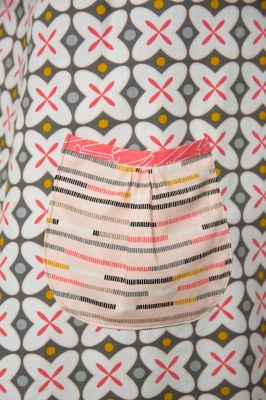 Why not browse our lovely fabrics with your little one to choose a favourite? The former high school English teacher in me adores that Jules names all of her designs after Shakespearean characters. She is based in Shakespeare’s hometown, Stratford upon Avon and is inspired by the Bard’s best-loved heroines. So she got me at that! The Kate Dress is named for the spirited Kate in Shakespeare’s comedy The Taming of the Shrew. 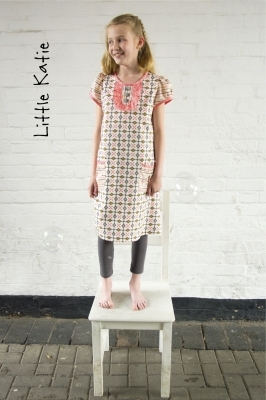 And Little Katie is for all the spitfires out there who want their handmade clothing to be functional and fun! 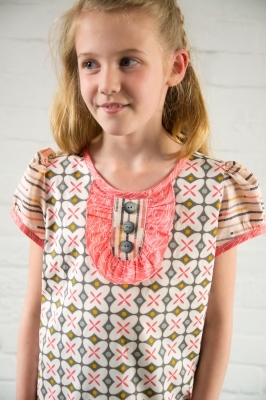 Jules’ designs flatter most body types and her children’s sewing patterns are no exception. Also, Sew Me Something patterns are printed on substantial paper – no easily torn tissue paper here! Jules’ blog is chock full of all kinds of tips and ideas for getting the most out of her sewing patterns. Why not grab a cuppa and have a read of her posts? And if, like me, you would love to go and spend some time in beautiful Stratford upon Avon, why not plan to include a fab workshop at Sew Me Something HQ? 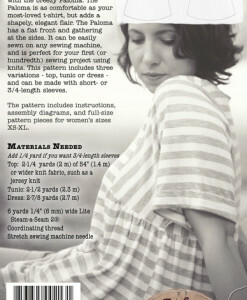 Be sure to tell them that Clare at Thread Head Fabrics sent you!